I learnt to drive with Alex for 13 months throughout 2014-2015 and overall it was quite an enjoyable experience. Right from the get-go Alex pushed me to move forward and advance with my driving skills - however he took on board all requests and feelings i had at the time and backtracked if need be to affirm my confidence in any areas I felt unsure on. He steadily built up my confidence by using his well experienced and in-depth knowledge of Nottingham via choosing routes and roads that matched my driving ability at the time, all leading me to pass my test 1st time round. It is easy to build a friendly and respectful relationship with Alex which helps ease you into the driving world. I would recommend him to you wholeheartedly. 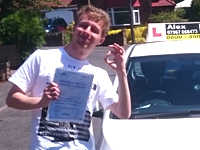 I would quite happily recommend Alex to anyone, and it's all thanks to him that i passed first time! I was naturally expecting the worst but he gave me enough confidence to get through it, despite passing, i still recieved some constructive critisism afterwards which was nice! Alex is a great guy who's very patient and is great at analysing what could be improved in your driving, in my case hazard awareness (or awareness of whats going on in general). Competitions involving who could spot speed limit signs first etc were very useful . Thanks again, Luke. I PASSED TODAY!! the MASSIVEST thankyou ever to you Alex. Alex has been so patient, helpful and wonderful all the way and I really couldn't have done it without him, because he totally believed in me even when I didn't and achieved the impossible by helping me have the confidence to pass. I am so happy! I would thorougly recommend Alex, and will totally miss our lessons each week, we had a right laugh! He is a thoroughly nice bloke and I am going to do pass plus next. Thankyou Alex, you are a star and have helped me do something i had never thought possible for me. I will start believing in myself more now I promise! Mike is so pleased too! Best day ever and now I can drive home for my wedding to the bestest place in the world....yes Leeds! I managed to pass first time with Alex with only three minors! I really enjoyed all my lessons and felt really comfortable with alex as an instructor. Hello! Just wanted to say a well deserved thank you to Alex for getting me through my test.Still getting used to be able to drive around on my own but its great..and my car is still in one peice I was really nervous about driving but theres no stopping me now and thats thanks to Alex. An incredibly long overdue thankyou for your fab teaching and getting me through the test first time with flying colours. I would recommend Alex to anybody. He is the most lovely chap and a fantastic instructor. Thanks again Alex!! Hey Alex, just wanted to say a big THANK-YOU for having the patience with me! i enjoyed our lessons so much, it's really wierd now not having any lessons on Thursdays. Every Thursday i keep thinking am sure there's something i'm meant to be doing! Still can't believe i passed first time with only 2 minors. lol. It's a week since i passed, am still keepin an eye on my speed , no fines as of yet, and hopefully i never will! Firday, the day after i passed i went to Lincoln with Rob i couldnt wait to go driving! The only bad thing about driving alone is that it's not as acceptable to sing along to your music! But anyway if anyone's reading this and wants a great driving instructor choose Alex, he's great, he's patient, friendly, never let's you down, uses a good learning techniques. I'll def reccommend Alex!!! c you soon for passplus. Thank you so much for having the confidence in me that I would pass my test. Never did I have a bad lesson as at the end of each lesson the debriefing always allowed me to take positives from them. Each lesson was a joy as our sarcastic banter always put a smile on my face. Now I have passed, and with only 6 minors, I will miss the 2hour periods of "lets see how many comical jibes we can make"! I certainly never believed I could do it! An excellent instructor with an excellent temperament to match! Very good value for money. Call in for cuppa or use of our toilet any time! Well Alex i finally got there!! and first time!! I would like to thank you for all your help. You made learning to drive easy and i will recommend you to everyone who is thinking of learning to drive as you are an excellent driving instructor. I'll let you know how i get on driving on my own in the next couple of months! A few months on and i aint hit anything yet! But a fantastic instuctor who made it easy for me to pass, very recomended. Been a few months now since i passed and its always been on my mind that i never got chance to say THANK YOU- the day i passed think i was on such a high and had to get back to work you dropped me off and was gone! Left me on my own to drive!!! Well just thought you might like to know driving is going great - No speeding fines or crashes!!! Not planning on getting any either... Ended up with a 1.6 Punto - quite a nice little thing newish too so got power stearing!!! Im sure your glad to be rid of me now though i was quite mardy at times but just proves words of wisdom when i wanted to give up was worth it! Would like to say alex is a wonderful instructor,very frindly and down to earth.I would definately recommend alex to anyone planning on taking driving lessons.Before taking lessons with Alex i had another instuctor he was very unhelpful.When i changed to taking lessons with Alex i was much happier and my driving improved thanks to Alex's tips and patience.Thank you alex for all your help. Just say big thanks for your instructions. My study was interrupted 4+ months when I moved from Slough to Nottingham. Compared with my previous Instructor, Alex is even more professional, patient and accurate in helping me become a better driver. Thank you so much for everything, GOODMAN, I will carry on my passplus study with this guy. I'm still buzzing from last Friday, thank you so much for getting me through it, one minor, still can't believe that!!! Looking for a cheap car now, got my eyes on a 1.2 Renault Clio, if you know of any cheap good cars going let me know. P.S If anyone is reading this, i would just like to say what a great instructor Alex is, patient, clear, relaxed and a good approach, I had 3 previous tests with 2 other instructors 9 years ago, did 3 weeks intensive with Alex and got one minor on my test, says it all really, so if you're wanting to learn how to drive, give Alex a call, you won't regret it, I certainly didn't.